(0 Customer Reviews) | Write Review 6 issues per year Since its first issue in 1923, Swimming Times has evolved into the essential guide to the aquatics world. Published by Swim England, the sport’s national governing body, and the Institute of Swimming, the largest trainer of swimming teachers and coaches in the UK, the magazine features a whole range of articles from across the swimming community to help you get the most from your time at the pool. The bimonthly magazine includes coaching and technique tips, teaching articles, club stories, interviews and features on the sports and personalities of swimming, para-swimming, synchronised swimming, masters, open water, diving and water polo. Since its first issue in 1923, Swimming Times has evolved into the essential guide to the aquatics world. 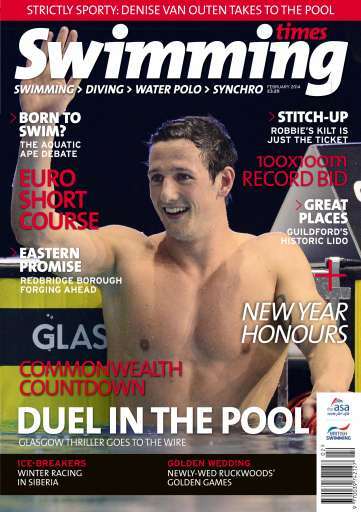 Published by Swim England, the sport’s national governing body, and the Institute of Swimming, the largest trainer of swimming teachers and coaches in the UK, the magazine features a whole range of articles from across the swimming community to help you get the most from your time at the pool. You'll receive 6 issues during a 1 year Swimming Times magazine subscription. You'll receive 6 issues during a 1 year Swimming Times magazine print subscription.